1) Assertive LeBron James shows how far Lakers have come. Back on Oct. 18, in the first game of the season, the Portland Trail Blazers comfortably handled a Laker team still stumbling around with new faces and a lack of identity. That night, Portland's continuity and shooting were a stark contrast to a Lakers team with neither. 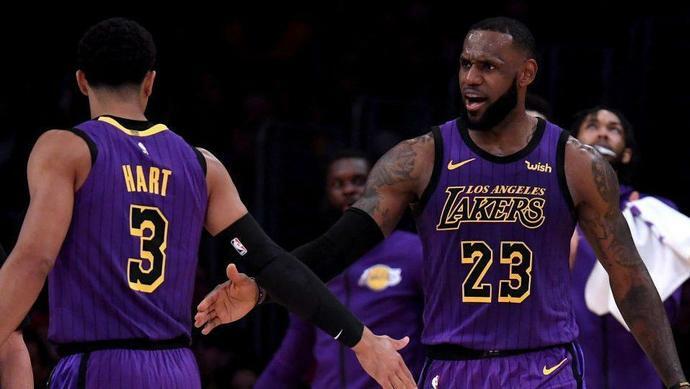 Nearly a month later, LeBron and the Lakers look dramatically better. LeBron played by far his most aggressive and best game as a Laker Thursday night, dropping 44 on the Blazers - passing Wilt Chamberlain for fifth on the all-time scoring list in the process - along with 10 rebounds and nine assists, leading the Lakers to a 126-117 win at home. Wednesday night LeBron reminded everyone that when he decides to take over there is nobody like him Anywhere. Especially when he is hitting threes from a Curryesque range, which he did from the game's opening minutes. LeBron was 5-of-6 from three on the night. One key to the Lakers' turnaround is they are playing much better defense, and they did for stretches against Portland. This isn't just about Tyson Chandler - although he helps - but over the past seven games, the Lakers have allowed an average of 104 points per 100 possessions, sixth best in the NBA. The Lakers are pressuring better and higher to stop penetration off the pick-and-roll, jumping in gaps and generating steals (9.6 per game in their last seven games), and getting blocks from their bigs at the rim. All of that is a dramatic change from the beginning of the season when the Lakers played matador defense and were letting teams walk to the rim at will. The Laker offense has come a long way, too, and it isn't all LeBron. The Lakers generated good chances by having Lonzo Ball as a screener, with Brandon Ingram getting isolated on a smaller defender (C.J. McCollum much of the time), and with JaVale McGee as a rim runner. The Lakers are still generating chances playing at pace, too, something that has become a key part of their identity. There was one bit of bad news for Los Angeles out of this game: Rajon Rondo broke his hand and will be out weeks. The Lakers will miss him on the second unit. 2) Jimmy Butler plays his first game with Philadelphia and… it's going to be a process. "The process" is over in Philly. The arrival of Jimmy Butler as a Sixers makes them a "win now" team. Now just starts another process: Fitting Butler into the Sixers offense and schemes. This process could take some time, too. Orlando proved that point, went on a 21-0 run in the fourth quarter to erase a 16-point Philadelphia lead and ultimately spoiled Butler's debut, 111-106. Butler had moments but was not the aggressive player we know, he let the game come to him more, something to be expected with a player on a new team who has been through one practice. He did show off his midrange game and defense at points, but expect him to be more aggressive as he gets more comfortable. The game showed that there will be a lot of adjustments needed from Philadelphia to make this work. That starts with Simmons, who had to work off the ball more when Butler created looks. The problem is Simmons is not a shooter so the Magic didn't have to respect him until he made a cut or got close to the rim, allowing them to pack the paint more and provide help. Simmons can make those cuts and finish, but coach Brett Brown would prefer Joel Embiid coming out of the dunker's spot and so the spacing becomes an issue. Embiid also didn't look quite in sync for stretches of the game, although he did rack up his first career triple-double with 19 points, 13 rebounds, and 10 assists. Those assists came when the Sixers were moving the ball the way Brown wants - fast side-to-side ball reversal that gets guys like J.J. Redick clean looks (he had a team-high 22). The Sixers did more of that in the third quarter. However, the ball movement was inconsistent as the Sixers tried to fit Butler into the offense. Late in the game when it was close, Butler was not taking over as much as serving as a decoy on the weak side for the Simmons/Embiid two-man game we have seen before. It's just going to take time. It's a process. A fully healthy Wilson Chandler will help, he had 14 points on 10 shots and the offense flowed much better with him out there rather than Mike Muscala. The Sixers have other questions to answer: Should they stagger Simmons' and Butler's minutes so each has longer stretches as the primary ball handler? If so, where does that leave Markelle Fultz, who is coming off the bench now and had eight points on 4-of-6 shooting. Jimmy Butler with the Sixers is not going to be a plug-and-play instant contender. The loss in Orlando made that clear. What matters now is how much better the Sixers look in a week. Then in a month. 3) Dwane Casey went back to Toronto and drew up a beautiful game-winner. Dwane Casey, the best coach in Raptors' franchise history, got a warm welcome from the Toronto fans Wednesday. As he should. The man presided over the best years of basketball in Raptors history and won Coach of the Year last year. Then, with the game on the line, he reminded those fans why he is so good - he drew up a beautiful game-winning play that got Reggie Bullock a clean look. The play had Blake Griffin coming off a double screen, one set by Bullock, and when his man Pascal Siakam slid over to help on the Pistons' biggest threat, Bullock slid into a scoring position. Well done for Casey and a quality win for the Pistons. One they needed. The guard scored 33 points as the Portland Trail Blazers took a 2-0 lead in their playoff series against the Oklahoma City Thunder with a 114-94 victory on Tuesday night. Tense at times with plenty of jawing back-and-forth between the teams, the series now heads to Oklahoma City for Game 3 on Friday. "I love it, that's what I live for," said McCollum, who missed 10 games late in the regular season because of a knee injury.